See how we're leading the way in wound care innovation during the Symposium for Advanced Wound Care (SAWC) Spring from May 7-11, 2019 in San Antonio, Texas. Before you go, register for our complimentary Industry Supported Symposia (ISS) session. Introducing CartiMax, the next advancement in viable cartilage allografts for the knee, foot, and ankle. 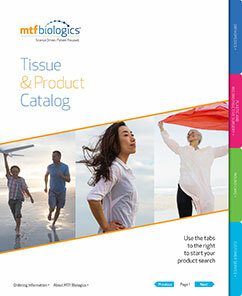 We are the largest tissue bank in the world. We are committed to honoring the donated gift, serving patients, and advancing science. The importance of quality allografts matters whether you are a physician, a patient or a potential donor. At MTF Biologics, we’ve been developing high-quality allografts for 30 years. Our breakthrough advancements, many of which have set industry benchmarks, are represented in a wide range of specialties. The work we do is both life-changing and life-saving. We honor the donor gift by dedicating ourselves to research, actively advancing the science of allograft tissue transplantation, so we can continue to help others heal. We open the door to possibilities by supporting our colleagues, our industry, and our employees. For our large grafts, meniscal and fresh osteochondral allografts, MTF Biologics graft matching provides orthopedic surgeons with the best anatomically-matched allograft tissue for their patients, eliminating extensive modifications during transplantation and saving valuable surgical time. Each year MTF Biologics awards major grants through a peer review process to applicants who support the advancement of tissue transplantation and regeneration. At MTF Biologics we see support of research as a way to further our commitment to donor families and donor recipients. Enjoy the satisfaction of working where people always come first. At MTF Biologics, you’ll have the opportunity to change lives on many levels. Join us and learn how.